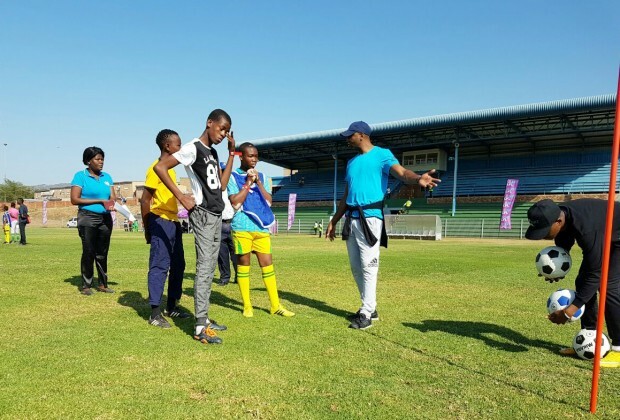 It was a bitter-sweet moment when the group of 100 aspiring footballers at the Vodacom NXT LVL Boot Camp was trimmed to 32 on Wednesday. It was a bitter moment for those who had to say goodbye but it was sweet for the 32 who made the cut. The 32 who remain at the High Performance Centre have all won because 16 of them will receive a full bursary to study at TuksSport High School while the other 16 will each have R50 000 paid towards their education in a scheme that will be administered by the Vodacom Foundation. Former Bafana Bafana captain and one of the six coaches, Lucas Radebe, admitted that it was a hard decision to select the 32. There was no time to rest for the 32 as they went to train after that announcement. But before that they called home with the devices Vodacom gave them to share the good news. After that the coaches – Radebe, Mark Fish, Portia Modise, Simphiwe Dludlu, Cyril Nzama and Edward Motale – prepared them for the exhibition match to be played Sunday at 3pm at Tuks Stadium. The players have been divided into two groups of 16 and the winners of that game will get the full bursary. On Tuesday they took a tour of the school the winners will be studying at from next year until they matriculate. While that will improve the education aspect of their lives, this camp has helped them improve on their football in a rare opportunity for these boys and girls, between the age of 13-16, to work with top coaches. It took about a year to put all of this together from the videos that were uploaded on the Vodacom NXL LVL website to enter the competition to the activations throughout the country and getting everyone here. Luvuyo Memela is pleased with the support of Orlando Pirates fans.